: Medium size dog, of strong and compact build, powerful bone-structure and quite massive with legs in proportion. The whole outline is that of power and endurance rather than speed. The voice on the trail is sonorous and pure, of changeable medium pitch, generally higher pitched in the female. : Skull as long as the muzzle. : Rather heavy, nobly chiselled. In profile looks like a medium length rectangle. : The line of the forehead forms a blunt angle with the topline of the muzzle. Superciliary ridges very developed; forehead very wrinkled. Occipital protuberance well pronounced. : Black, large and wide. : Elongated; truncated at the tip; neither wedge-shaped nor pointed. : Thick and drooping; corner of bottom lip drooping. : Strong jaws, sufficiently long, with rectangular bite. : Gentle and serene expression; set on the slant, not very deep-set, dark brown; lower lid drooping in older dogs. : Set low, quite long, hanging, slightly rounded at the tip. The base of the ear flap is twisted and hangs close to the head. : Remarkably thick at point of insertion with the body, powerful, muscled, of medium length. Dewlap is loose and very richly folded. : Long, broad and muscled. : Thoracic cage is ample, wide and deep in proportion. The sternal region descends to the elbows. Ribs well sprung, long like the whole rib cage, closer to the vertical position than in other breeds. : Belly capacious, broad, nearly as deep as the chest. Abdomen not too tucked up. The flank is not hollow, well filled, rounded with a possible hollow below the last ribs. : Rather low set, thick, covered with long hair in its lower part, hangs below the hock, slightly drooping; from half the length of the leg, slightly curved. In normal movement slightly raised but not rolled up. In action, slightly raised, but not above the horizontal. : Shoulder blade oblique, muscled, well developed. : Pastern joint: Well defined, prominent, neat, lean, of size corresponding to the pastern. : Of quite a strong bone structure, strong muscles. Toes tight. Nails strong, thick and short in working dogs; they are light coloured when the toes are white and black when the toes are fawn. : Toes tight. Nails thick, strong and short. Pads large, covered with thick skin. : Long, strong, with well developed muscles and strong bone structure. : Sloping, fairly short, well muscled. : Normally moves at a slow and heavy short trot. When hunting, he quarters and chases at a heavy gallop. : Medium length hair, thick, with a dense undercoat, a little longer on the back, at the back of the hindquarters and on the lower part of the tail. : Head and ears, except the lateral sides of the skull, of tan colour; the ears a little darker than the rest. The legs, sternal region and thighs also tan. Body black or dark grey almost black; in ancient Polish hunting language it was called « podzary » (burnt). 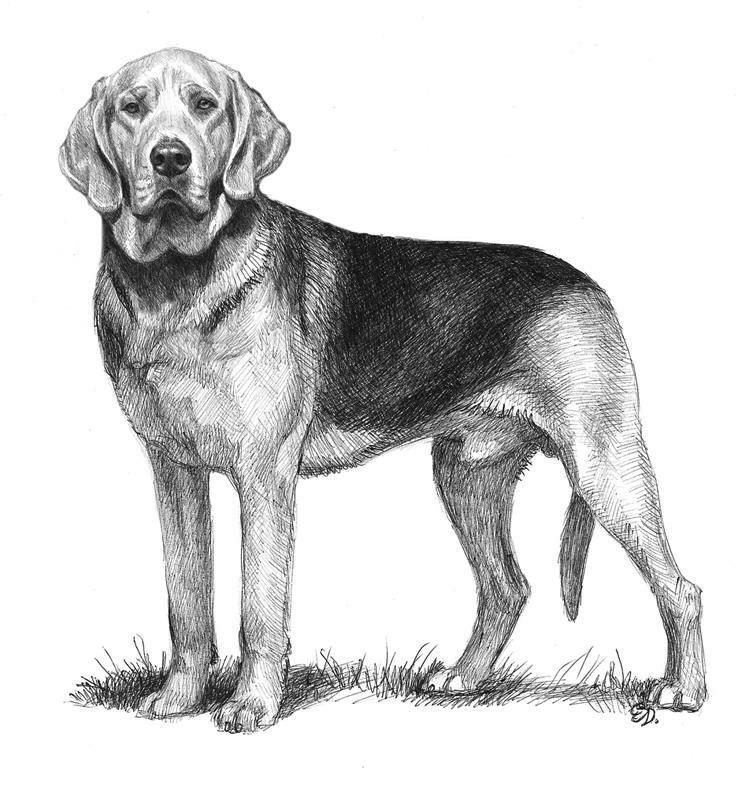 The tan colour, essentially fawn, has various intensities of that tone up to cinnamon, very much appreciated in the Polish Hound. The white hairs, admitted in shape of a star, forming a blaze reaching to the muzzle, on the chest, the extremities of the legs and of the tail. The black may form a mantle which extends as far as on the head. Distinct tan spots above the eyes. Black which extends as far as the muzzle of the Polish Hound is a case for disqualification. Head with occipital crest not enough pronounced. Upper orbital arches not sufficiently defined. Muzzle too pointed; black muzzle. Ears too long or too short, standing away from the head. Tail fine, too short or too long, barely covered with hair, rolled up.